See The BraBall in Person! The BraBall is Finished! A big THANK YOU! Largest Donation - 2,700 BRAS! 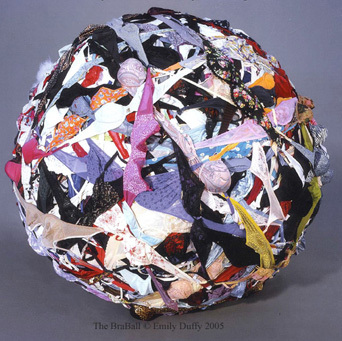 The BraBall, by Emily Duffy. many things, a breast-cancer survivor. Web design by Ken Duffy. For corrections contact: emilyd (new address) at braball dot com. Last updated November 5, 2012. Website launched April 14, 2001.